In the distant flying kingdom of Zeal, a young prince named Janus was born with The Sight. He grew up a strange child, seeing things that others could not, and his only friends were his elder sister, Schala, and his pet cat, Alfador. His mother the queen was driven mad by the pact she had made with a demon named Lavos, and this caused their civilization to be destroyed. Janus survived after being lost in a land of "Mystics," non-human creatures with great magical talent. He grew up among them, now called Magus, eventually becoming their overlord and greatest sorcerer. However, after an encounter with a mysterious hero, he abandoned his throne and joined the hero in stopping the ancient demon Lavos from rising. Now free and living life for his own purposes, he dwells in the depths of one of Arcadia's enchanted forests, traveling the realms as it suits him. Physical Abilities: Magus is in excellent physical condition, highly athletic and exceptionally agile. Being born of Zeal and possessing elf-like blood, he is immune to most ailments which trouble Humans, and is much more long-lived. Black Magic: Magus has extensively mastered the art of dark sorcery, and as such his powers include mastery of most of that disciplines spells. This includes, for example: Fire magic, Ice magic, Lightning magic, Draining magic, Barrier magic, and Shadow magic. For role-play purposes, he is a master of elemental, life- and spirit-draining, mental effect, warding, and transformation magics. Sorcery: Aside from his combat-based powers, Magus can create various magical effects that one would expect from an accomplished sorcerer: illusions, teleportation, performing ritual spells, creating potions or other alchemical agents as those noted in his equipment, and generally doing the sorts of things one expects from a master wizard. Resistances: Magus has high resistance to weaker black magic. "Level 1" black spells do little damage to him, and he is able to resist many status-changing spell effects. He was born with a very strong will, and the struggles of his life have made it even stronger. The Sight: Magus has The Sight, an advanced sense that carries to him insights, even glimpses of strong thoughts projected by others. It also at times shows him hints of the future, and he is able to read most omens. Knowledge: Magus has an extensive knowledge of Zeal technology, putting him well ahead of many denizens of Arcadia. He knows how to operate various sophisticated vehicles and equipment, and would have little trouble adapting to many worlds' devices. He has also studied the balance of the Elemental Forces, especially the Shadow elemental, as they relate to magic and the mystic energies of the many worlds. Combat: Magus is a skilled warrior, and though physical combat is not broadly his specialty, he wields scythes and sickles with deadly skill. Weaknesses: Despite all of Magus's power, he is particularly weak against white magic, so anything which embodies the Holy elemental will have a devastating effect on him. The spell "Holy" can cripple him in one direct strike if cast by a powerful mage. Oath of Duty: Magus seeks to atone for his past. As such, he will always act to help innocents or those of good heart in whatever way he believes they most need help. This might mean giving his life to protect them or helping them learn a difficult lesson, depending on the situation, but he will never simply ignore someone truly in need. Alchemical Concoctions: Magus employs a wide variety of magical potions, remedies, and enchantments, such as the well-known Potions, Remedies, Ethers, and so forth, including the rarer Elixirs and Hold Gas. Having studied Zeal alchemy, he brews these all on his own, which means he must always keep his stock of alchemical reagents properly filled. Wealth: Magus has collected a vast store of wealth over his life, and his supply of the various currencies used in Arcadia is virtually endless. Of course, most of his treasure is kept sealed away in a mystic vault all the time. 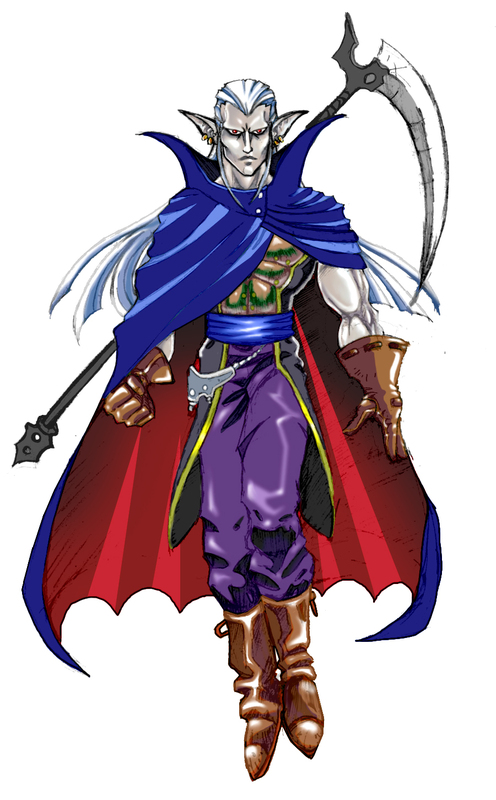 Equipment: Magus wears an enchanted cloak and wields an enchanted scythe called "DoomSickle." The cloak protects him from many forms of damage and also renders him immune to magic that would directly alter his mind or body. The scythe is enchanted to be unbreakable, never dulling, and can cut through any common material.